A 30-year veteran of teaching in California school districts testified for the defense today in Vergara v. California, saying state laws protecting teacher employment are critical to maintaining teacher effectiveness in the classroom. Linda Tolladay, an eighth grade science teacher in the Madera Unified School District outside Fresno, told the court that replacing seniority with a measure of effectiveness for layoff purposes would be disruptive to teamwork and would leave teachers vulnerable to a range of unfair judgements. Her views echoed testimony of other defense witnesses in the case, in which nine students are challenging state laws on seniority, tenure and dismissal. They are contending that the laws keep in place ineffective teachers at the expense of better ones, thereby denying equal access to a quality education. “Superintendents, administrators have very little understanding of what goes on in a classroom,” she said. And with a system that holds to reverse seniority in times of layoffs, more experienced teachers have greater latitude in using their own teaching techniques, she said. The defense next called to the stand Jeannie Oropeza, who works for the California Department of Education as Deputy Superintendent of Public Instruction, Services for Administration, Finance, Technology and Infrastructure Branch. She recounted lots of details about how districts are funded, but in repeated efforts by Supervising Deputy Attorney General Susan Carson to get her opinion on the “highly unlikely” possibility teachers would be laid off in the future because of budget cutbacks, plaintiffs’ objections were sustained, and she was barred from answering. 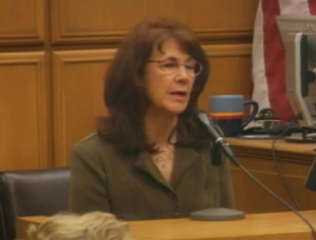 The court also heard from Roxann Purdue, a consultant to the California Commission on Teacher Credentialing. She testified that about a study showing that 9.5 percent of California teachers between 2007 and 2011 ended up with “mis-assigments,” meaning they are not qualified for the subject of a class they are sent to teach, like a phys ed instructor teaching math. The thrust of her testimony was that teacher ineffectiveness can be caused by mis-assignments, which are the result of school district decisions, not state law. But under cross-examination she conceded that mis-assignments can also occur because of layoffs and a reduction in class size. She also clarified that the statistics in the study were not absolute, that while a phys ed teacher leading five periods of math would represent one mis-assignment, the same teacher assigned to math, biology and history classes would represent three. “So they all over the ball park,” said Judge Rolf Treu, who seemed as skeptical as anyone in the room. Previous Posts: Teachers refute ‘ineffective’ charges by Vergara witnesses; Witnesses in Vergara v. California hail collaboration despite API gaps; Three more witnesses in Vergara v California say collaboration works.